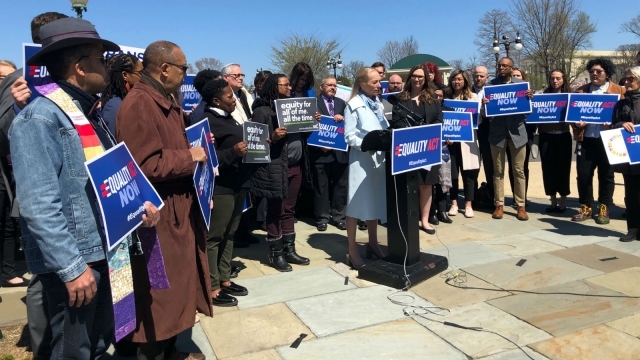 Ahead of the first-ever hearing on the Equality Act tomorrow in the House Judiciary Committee, civil rights leaders and advocates joined Congresswoman Mary Gay Scanlon on Capitol Hill to highlight the critical need, efforts and unprecedented support for H.R. 5. The crucially important, bipartisan legislation would provide clear, comprehensive non-discrimination protections for LGBTQ people and strengthen existing protections for all people covered by the United States’ civil rights laws. Leaders of civil rights organizations and members of the LGBTQ community shared stories of discrimination that demonstrate the urgent need for the long overdue, historic legislation. The House Judiciary Committee and Chairman Jerry Nadler (D-NY) will hold the first hearing of the Equality Act on Tuesday April 2 at 10:00 AM. “Protecting LGBTQ Americans from discrimination is about people, not politics. It’s about building a country where every one of us can go about our daily lives without the fear of discrimination or violence – no matter who we love, who we are, or where we live,” said Masen Davis, CEO of Freedom for All Americans. “Experiencing discrimination when trying to access health care is all too common for LGBTQ people. The Equality Act is the first step in ensuring that people of all gender identities and sexual orientations get the safe, affirming, and equal health care we deserve,” said Angela Ferrell-Zabala, National Director of Strategic Partnerships, PPFA. Reintroduced in Congress on March 13 by Representatives David Cicilline (D-RI) and Brian Fitzpatrick (R-PA) in the House and Senators Jeff Merkley (D-OR), Tammy Baldwin (D-WI) and Cory Booker (D-NJ) in the Senate, the bipartisan legislation has growing, unprecedented support from nearly 70 percent of Americans, more than 280 members of Congress, more than 180 major businesses and more than 300 statewide and national organizations. Currently, 50 percent of LGBTQ Americans live in the 30 states that still lack statewide legal non-discrimination protections, leaving their residents and visitors at risk of being fired, denied housing, or refused service because of who they are or who they love. The legislation prioritized by Speaker Pelosi would ensure LGBTQ people are protected under the nation’s civil rights laws.